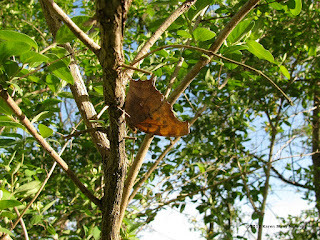 An orange butterfly caught our attention as it fluttered by yesterday, but it wasn't until it landed that we noticed the sharp, irregular shape of its wings. We identified it as a member of the anglewing family, but it wasn't until we looked closely at our photos that we were certain what it was. The butterfly in question . . . a Question Mark. Our Nature Guide Jon Latimer gives us more information. "The Question Mark butterfly (Polygonia interrogationis) looks very similar to its close relative the Eastern Comma butterfly (Polygonia comma) except for two marks that are clearly shown in these photos. 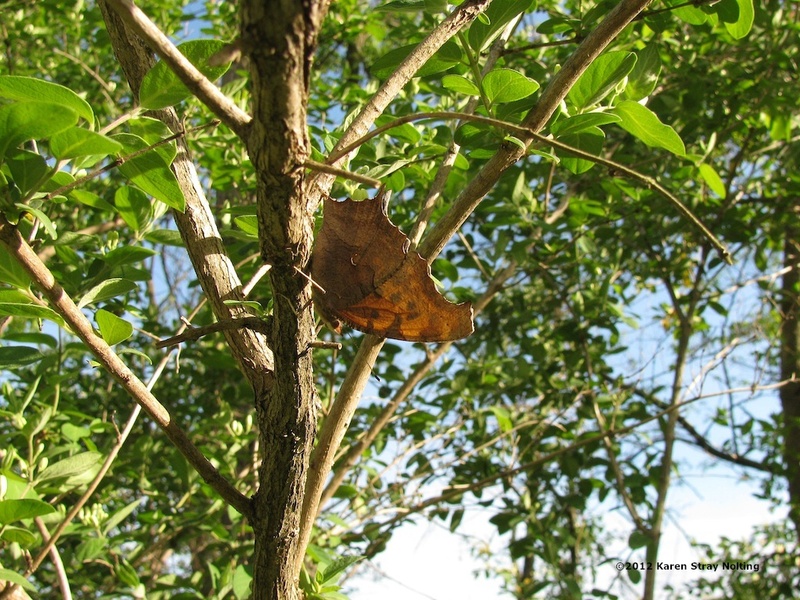 First, if you look closely at the photo of the underside of the butterfly (click on the photo below to enlarge), you see a small silvery mark that resembles a question mark (which gives this butterfly its common name). Then, if you look at the photo of the red-orange upper side of the butterfly (click on the photo above to enlarge), you will see that its forewing is covered with black spots. 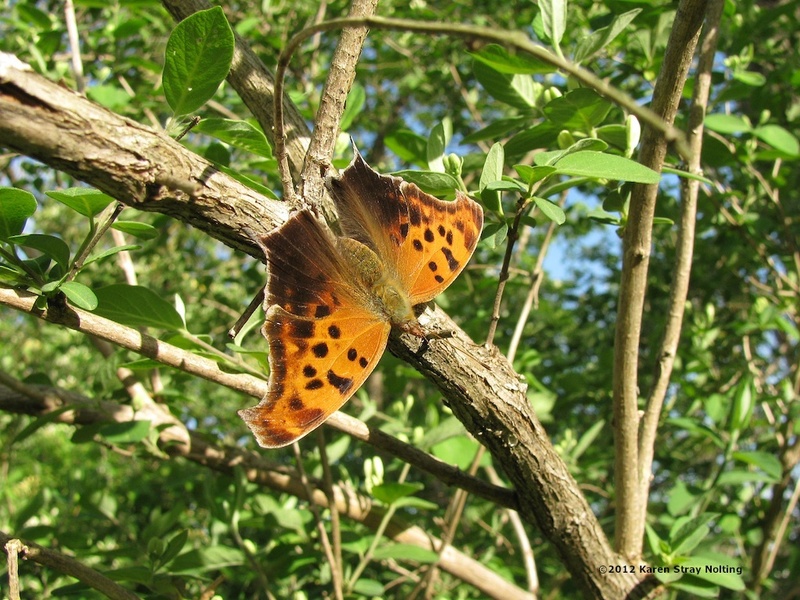 An Eastern Comma also has spots, but notice that this butterfly has a black spot that is shaped like a dash near the corner of each wing. When you see this dash, you can be sure that the butterfly is a Question Mark. "There are two seasonal forms of Question Marks. The ones now in our area are the winter form. They were born last August and probably hibernated locally through winter, although many Question Marks migrate south and return north in spring. These adults will lay eggs between now to the end of May. Their eggs will produce a summer form that will live from May to September, laying eggs that develop into the next winter form. "Question Marks can be found in wooded areas with some open space, such as city parks or along fence rows. Males perch on leaves or tree trunks in the afternoon waiting for females to pass. Females lay eggs singly or in stacks under leaves of plants. 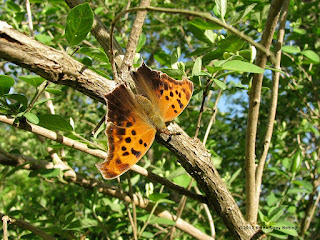 Their caterpillars feed on nettles, false nettle, hackberry, Japanese hop and elms."